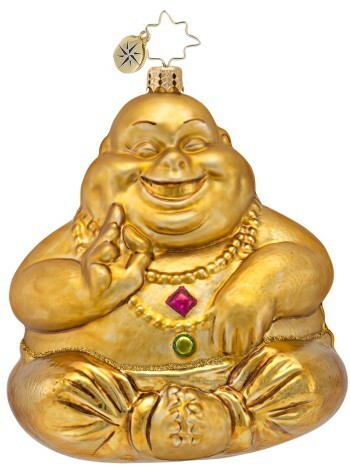 This cute Buddha ornament from the Christopher Radko studio offers something interesting this Christmas. The golden nirvana Radko Christmas ornament is a great gift idea for those with an eclectic point of view and those who collect specialty ornaments of the highest quality. This Radko ornament is crafted entirely by hand. It begins with premium blown glass fashioned into a Buddha with outstanding detail. The gleaming gold semi-gloss finish is produced be several layers of quality lacquer paint applied by hand. If you're looking for creative gift ideas for a Buddhist friend or someone who enjoys unique ornaments, the golden Buddha Radko ornament will be a winner.